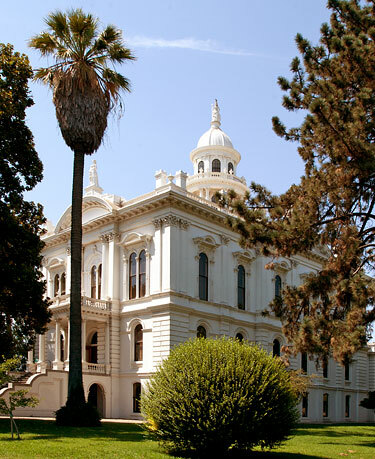 The Merced County Courthouse is a fine example of the expertise of one of the California State Capitol Architects, A. A. Bennett. This building is the best proportioned and well handled of its type in central California. Its facade, rendered eclectically in the Italian Renaissance style, is typical of the American esthetic for public buildings before the turn of the century. True to tradition, this courthouse symbolically illustrates the American ideal of respect for justice. 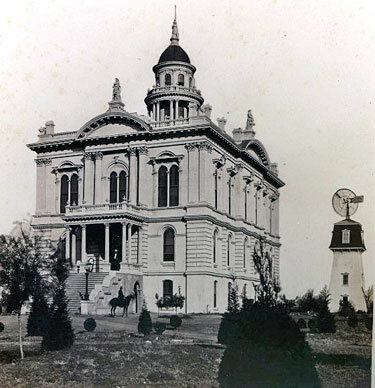 A courthouse in Fresno, California, also completed in 1875, was almost identical in every detail to the one in Merced. It was so similar that one is drawn to conclude that Mr. Bennett was also the architect for this courthouse. The Fresno courthouse was drastically modified in 1893 by the addition of two wings, three stories high. The addition was done in the classic style which was at the apex of its popularity in that year. A monumental portico and a larger dome were also added. These additions, necessitated by an earlier fire and crowded facilities, caused the well proportioned original building to become lost within a clumsy shell. Later, the entire building at Fresno was demolished. Its twin in Merced remains relatively unscarred.